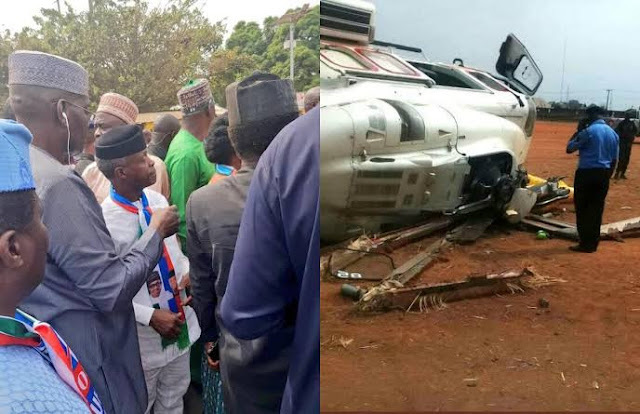 The Accident Investigation Bureau ( AIB ) has released the preliminary report of the helicopter crash involving Agusta Westland W 139 Caverton Helicopters which flew Vice President to Kabba in Kogi State on February 2nd. Speaking at a briefing at its headquarters at the Murtala Muhammed International Airport, Lagos today Wednesday February 13th, AIB Commissioner and Chief Executive Officer, Akin Olateru, said preliminary report shows the helicopter crash was atrributed to the effects of a blown out generator during its landing in a dry dusty environment. The report said Caverton should have carried out risk assessment test at the Kaaba stadium before the flight. Olateru said though the investigation into the crash is ongoing, it has however issued two safety recommendations to the Nigerian Civil Aviation Authority (NCAA) and the operator : Caverton Helicopters Limited. He added that the NCAA should issue advisory circular to helicopter operators on the effects of brown out and how to mitigate its effects. The second safety recommendation, Olateru said is for Caverton Helicopters to carry out proper risk analysis and assessment before operating flights into unapproved landing pad. Olateru said the final report on the accident will be released in a few months.